Saying anything about what really happened when Israel was created in Palestine in 1948, or what has been happening ever since to Palestinians in Israel proper, and what remains of historic Palestine—the West Bank and Gaza—can get you into lots of trouble, especially in the US. And when you do that in a film the stakes are even higher because a good one shows the real facts on the ground. You can argue till kingdom come about these, but facts on the ground are real, and ideas aren’t, except insofar as they construct the reality beneath our feet. Schnabel’s striking new film is as visceral and dreamlike as his “Before Night Falls” (2000), and equally fractured in narrative terms, but I think this works to his advantage because the facts on the ground in Israel/Palestine are so fractured that piecing them together so they make “rational sense”—whatever that means—would be a gross disservice to putting the viewer in the story, or rather linked stories (1948-1993) around and about the young girl Miral Shaheen (Freida Pinto) who sees history come alive before her eyes, in often painful ways. Schnabel tells his story through many arresting images, beginning with one of a tree being uprooted for a big Christmas party in Jerusalem where Berta (Vanessa Redgrave) proudly announces that it will be replanted as in years past. But the General Assembly of the UN has just adopted its Partition Plan—UN Resolution 181(29 Nov, 1947)—which breaks Palestine into many grossly unequal parts. The facts on the ground are changing. And it’s in this new political landscape that Hind Husseini (Hiam Abbass) discovers 55 Palestinian children shivering in the dark blue early morning light of a stone-walled Jerusalem street, who’ve fled the massacre of their parents, siblings, cousins, friends, at their village, Deir Yassin, scant hours before, which The New York Times reported the next day, 10 April 1948, as “One hundred men in four groups attacked at 4:30 o’clock in the morning … Ten houses were blown up. At others the attackers [the Zionist Irgun and Stern Gang militias directed by the Hagana] blew open the doors, and threw in hand grenades.” Hind houses the refugee kids in two rooms, which get bombed—and then in her grandfather’s sun-drenched mansion she starts the Dar El Tifl orphanage/school, with hundreds of children fleeing the Zionist massacres all over Palestine. Miral arrives, at age five, in 1978, after the death of her mother, and is drawn into the First Intifada (1988-1992), ignited when an IDF (Israeli Defense Forces) convoy ran over four workers in Gaza. Schnabel intercuts Miral’s story with those of other women, beginning with Hind—then Miral’s mother Nadia (Yasmine Al Massri), then Fatima (Ruba Blal). This gives the film a rich and complex psychological texture which is superbly visualized by Schnabel’s cinematographer Eric Gautier, who did such wonderful but completely different work on Patrice Chereau’s “Gabrielle” (2006). He’s aided and abetted by the equally superb work of editor Juliette Welfling, production designer Yoel Herzberg and art director Nir Alba whose combined efforts provide dramatic contrasts in scale, and richly detailed places for the story to flower. But none of this would matter if the characters didn’t pull us through the picture and pull us through they do. 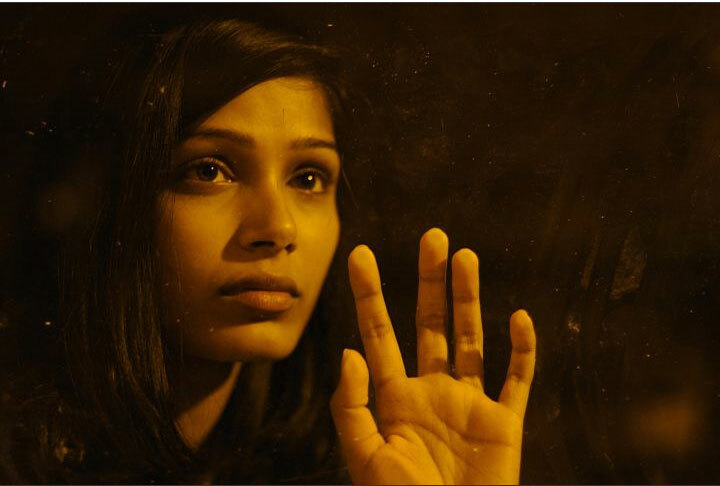 Freida Pinto’s part couldn’t have been easy, but her commitment to the story shows in her body language, expressive voice and eyes, and her voice registers the complexity of the feelings the role demands, be it shyness, fear, or stubborn defiance. The woefully under-appreciated Alexander Siddigthe best thing in Stephen Gagham’s “Syriana” (2005) gives a beautifully shaded and very touching performance as her father, Jamal, who’s the imam of Jerusalem’s Al-Aqsa mosque on Temple Mount. And Vanessa Redgrave of course commands center stage in her few very brief scenes. But the performer who effortlessly dominates the picture is the beautiful justly awarded Palestinian actress from Nazareth Hiam Abbass (Najwa Najjar’s “Pomegranates and Myrhh” (2009) who can do just about anything.